SAL DeTRAGLIA'S VIRTUAL TAPAS BAR: ROCK THE BOTA. How I lament the disrespect with which the Spanish wineskin, or bota, is treated in 21st century America. The bota, an essential tool for thirsty Spanish shepherds throughout the centuries and lovingly memorialized in the writings of Hemingway and Cervantes, has been reduced in the US to a vessel used by frat boys to smuggle peppermint schnapps onto ski slopes. What a pity. If more people were to appreciate the history and craftsmanship surrounding the bota, as well as the simple rules for its use and maintenance, then perhaps it would be treated with the respect it deserves. On behalf of Hemingway, Cervantes and my adopted country of Spain, I resolve to defend the bota’s honor in the paragraphs below. The bota is as old as Spain itself, existing before wooden casks and bottles came in to use. It is said to have evolved from the pellejo, which is the skin of a largely intact goat carcass sewn and sealed liquid tight, and was used by Spanish families to store several months’ supply of wine. It was a line of pellejos that succumbed to the mighty sword of Don Quixote in the upstairs loft of the inn. 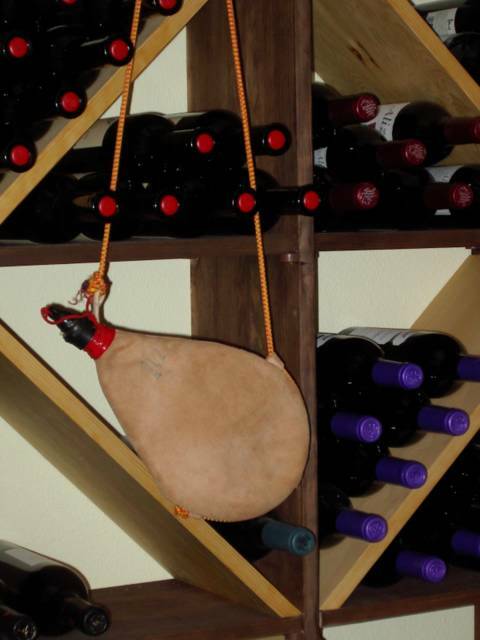 The bota evolved as a small pellejo, holding approximately 1.5 liters of wine for individual use. No Spanish shepherd would dare tend his flock, or farmer work his fields, unless armed with bulging bota. Botas are still used in rural Spain, and have three common characteristics: they are made from goatskin, have a curved shape and impart a slight pitch flavor to the wine. Making a quality bota is not like mass-producing tennis shoes in a Far East sweatshop. Rather, bota construction is considered an art in Spain and the botero a respected artisan. Bota-making is a labor-intensive process requiring a period of apprenticeship and a heavily calloused set of hands. First, the hair of the goatskin is trimmed to a length of one centimeter and the skin is salted in order to close the pores. A pattern is then laid upon the skin and cut. The pattern-shaped skin is folded together, hair side out, and lightly stitched. The botero then intertwines several hemp threads to make one strong thread and rubs it with pitch so that it will pass more easily through the skin. The pitch-rubbed hemp thread is strung through a needle tipped with a stiff wild boar hair, and the bota halves are tightly sewn together. The botero keeps constant pressure on the stitching in order to assure a wine-tight seam. When tightly sewn, the bota is turned inside-out (so that the hair side faces in), wetted and inflated. The botero then pours a brew of hot pitch and olive oil into the bota and swishes it around to distribute it evenly. When the pitch cools, it clings to the hairs and renders the interior impermeable. Finally, the botero attaches a plastic spout (which, in bygone days, was fashioned from bone or wood), wraps the spout with a collar and attaches a carrying cord. Like a high-quality corkscrew or well-stocked cellar, the handcrafted bota is now ready to serve its thirsty master. But how does one use and care for a bota? For guidance on this crucial matter, there is only one place to turn…a Spanish grandfather. As such, I sought the counsel of 78 year old Julio Montealegre, a lifelong Madrid resident who claims to have taken mother’s milk from a bota when Calvin Coolidge was in the White House. He gave me his ten commandments for use and care of a bota. I. THOU SHALT NOT INFLATE A COLD BOTA. Never! When deflated, the two-sides of the bota will touch and, being covered with pitch, stick together. If you forcibly inflate a cold bota, you will likely tear the pitch from one of its internal walls. The end-result…a bota that can’t hold its liquor. A bota should be heated with a dry heat source (e.g., the summer sun or a heater duct) in order to soften the pitch before inflating. II. THOU SHALT “CURE” A BOTA BEFORE THE FIRST FILLING. When you first unscrew and sniff the inside of a new bota, it smells like a freshly paved parking lot. “Curing” removes (or, at least, drastically reduces) this unappetizing bouquet. To cure a bota, pour in a cup of wine and a cup of brandy or cognac. Let it sit for two to three days, flipping the bota every 12 hours or so, and discard. III. THOU SHALT NOT STORE SOFTDRINKS IN A BOTA. This is both sacrilegious and bad for the health of your bota. Softdrinks will eat away the pitch. Botas should only hold wine or liquors with an alcohol content less than 25 degrees. IV. THOU SHALT NOT LEAVE AIR INSIDE A WINE-FILLED BOTA. Ignore this commandment if your goal is to dress a salad. There are two ways to avoid this problem. The most effective is to drink your bota dry during the same day that you fill it. Practical as this option may be, traffic police frown upon it. The next best solution is, after a good long drink, to hold the bota vertically with the spout pointed upward and gently yet steadily squeeze the bottom so as to force the wine upward. When you see the first drop of wine rising from the spout, screw on the cap. V. THOU SHALT NOT HANG A BOTA. If you hang a bota, the pitch will drip down to, and accumulate in, the bottom. The result will be a bota that seems to have swallowed a tennis ball. A bota should be stored flat and horizontal. If the bota is empty, then it is a good idea to cover the spout with a small piece of plastic wrap before screwing on the cap. If the bota should accidentally slope downward and a drop of pitch migrates down and out of the spout, the plastic wrap will prevent the pitch from welding the cap shut. VI. THOU SHALT NOT WASH AN EMPTIED BOTA. Soapy water will taint the pitch and, obviously, your next gulp of wine. VII. THOU SHALT NOT PUT WHITE WINE IN A RED WINE BOTA. And vice versa. This is one of the few instances where the practice of segregation is encouraged. VIII. THOU SHALT NOT BLOW CIGARETTE SMOKE ONTO A BOTA. Most Spaniards break this commandment, but it is still good advice. The bota’s leather absorbs cigarette smoke like a sponge. I once bought a bota from a smoky Barcelona bar. After several weeks of airing out, it still smelled like the Marlboro man’s finger. That smelly bota, for which a Spanish goat bravely gave its hide, ended up in the garbage…unused. IX. THOU SHALT NOT PUT GOOD WINE IN A BOTA. The bota will impart a slight pitch flavor to any wine that it is filled with, so save your gran reserva for a crystal decanter. Nonetheless, pitch flavor or no pitch flavor, a less-than-stellar wine always seems to taste better when fired into the mouth from a bota held at arm’s length. X. THOU SHALT NOT RUB A BOTA WITH SUNTAN LOTION. Mr. Montealegre concedes that few people would do such a preposterous thing, but his son-in-law once broke this commandment and ruined his bota. He therefore felt compelled to warn others. Show a little respect! Slung over the shoulder during a sunny day’s hike (rather then stuffed under a ski parka during Spring Break), a handcrafted and well-maintained bota will provide its owner with years of bacchanalian pleasure. What is the difference between "the bota" and "the porron"? I understand some skill is needed before trying. Any courses/seminars before? Our students of Spanish in India would like to know. By the way, using the bota in the USA would avoid the newspaper sheet hiding your Budweiser.No ticket for drinking while driving. A good merchandising for "the bota" would be a good business!!! The "bota" would be sold with a CD including Spanish drinking songs such as "El vino que tiene Asunción" or "Cuando yo me muera"(1). echa media de vino al porrón!" (1) If you are a teacher, use this song to explain the f.... Spanish subjunctive. If you need translation for the song, please contact me. We admit all the minor cards AE, VISA, Mastercard and and some of the major (Potash, Avery).Special prices for mothers with babies,fired teachers, writers, nuns, priests or bishops . A "porron" is a glass beer mug with an erection. To describe the technique for using a porron might be shocking to the sensibilities of my elderly readers. Suffice it to say, a porron is not well-suited for use on the ski slopes -- unless you want to spend the afternoon in the ER having glass shards removed from your pectorals. My mother recently brought me back a ZZZ bota at my request from Madrid, full of vinegar for the curing process. Problem is, it seems to have a slow leak right in the middle of the leather, which I attribute to the interior pitch possibly rubbing away during transit or something like that. Do any of your sources in Spain have advice for dealing with leaks? My first guess would be to heat it up as recommended while empty to try to even out the pitch on the inside, but figured I'd see if you could find better advice. My suegros just got me a bota, I love it. 1) I can see I might go without using my bota for weeks at a time. While I'm not using it, what should I keep in it? How long can I keep wine in it without it degrading? Any advice on drinking from the porron/bota? I still make a mess out of both of them. We need a video clip or something? Thanks for your messages. I would especially like to apologize to Lucas, whose message may have been sitting here for months without my knowledge. In any event, I will try to address your questions...although I should disclose that I am more a bota fan than an expert. 2. Mateo: When I am not using my bota, I store it empty, inflated (so the inner walls don't touch and therefore don't stick together), and laying horizontally. Never store it hanging. Every few weeks, I flip it over. This keeps it from accumulating a big glob of pez on the bottom. I've stored my bota this way for three years, and with no problems. Others have recommended keeping a dormant bota full of wine, which I've personally found unnecessary. 3. Mateo: As for how long wine can be stored without degrading, my personal rule of thumb is three days. Wine seems to keep better if the bota is stored in a cool location. But I must highlight the Ninth Commandment (don't store good wine in a bota). Following this rule means using cheap wine...therefore it doesn't hurt so much to dump half a bota of old wine down the sink and refill with a new wine. This is the approach I take. Life's too short to drink wine gone bad. 4. Mateo: As for drinking neatly from a bota or porron, that is a toughie. Hemingway acknowledged this problem in his book, "Death in the Afternoon." He referred to the tradition of tossing botas into the bullring after a particularly good performance by the Matador, and mentioned that Matadors don't like this tradition because they tend to spill drops on their expensive suits. As such, it's an age-old problem. Of course, you can wrap your lips around the bota or porron spout...but you shouldn't. It's a breach of etiquette. Personally, I start with the spout fairly close to the lips (although not touching) when I start drinking, straighten the elbows somewhat during mid-drink, and then return the spout close to the lips (again, not touching) when ready to finish a drink. I also will (a) wear a dark shirt if I know than a bota/porron encounter is coming later in the day, or (b) remove my shirt entirely if weather/circumstances permit, or (c) tuck a napkin into my collar (bib-like) if I am drinking from a porron in a restaurant. To be honest, I tend to drink wine from a glass 99% of the time. I usually use my bota only during hikes, so I am not too concerned about making a mess. I hope my suggestions are helpful. Thanks again for visiting the VTB. I recently returned from a Spain with a wineskin purchased in Granada, and much to my displeasure, it leaks. In hindsight, I had already broken several rules: tried to inflate a cold bota, left a bota full of air and hung it up. I didn't believe the latter to be a problem, since it was hanging when I purchased it! Needless to say, I will try to salvage my authenic wineskin, by drying it, sqeezing out all the air , reheat it and try to redistribute the resin. Do the sides overlap at all to prevent leaks? Also, does a bota always leave a pitchy taste and what kinds of wines are generally kept in them? And lastly, can they be used for water or is there some reason why wine is the only thing to go in there? I just butchered a small goat and want to make a Bota out of him. Thanks in advance!! !